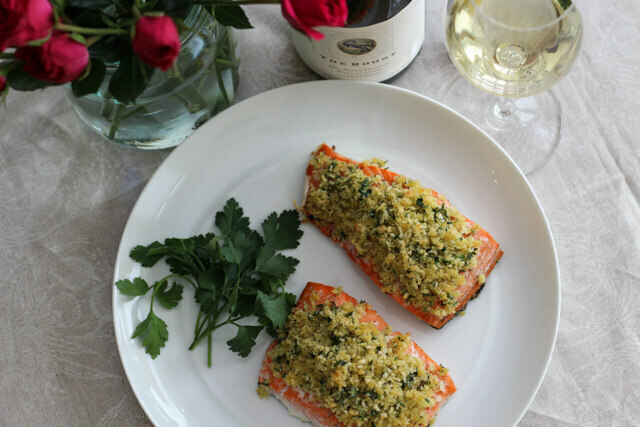 This simple but elegant salmon entrée comes to us from Jane at Adventures in Food & Wine. Not only is it excellent for a busy weeknight or as the star at your next dinner party. This dish pairs favorably with our Roost Chardonnay no matter the occasion. Line a baking sheet with parchment paper. Put the salmon fillets on the baking sheet and sprinkle with salt and pepper. Bake for 10 minutes or to desired doneness. Remove from the oven. Turn the oven to broil. While the salmon fillets are baking, in a small bowl combine; panko, parsley, oil, thyme, and Dijon mustard. After the salmon has baked for 10 minutes, spoon the panko mixture evenly over the fillets. Pressing down gently to adhere the panko mixture to the fillets. Place the baking sheet back into the oven and broil 1 to 3 minutes or until topping is golden and crisp.